The latest ONS data show the volume of GB construction output rising by close to 5% in 2017. This marks four years of strong growth, with output now 25% above that in 2012. In broad terms private housing and commercial building have driven workloads since 2012, although the outlook for these markets is now unsettled. 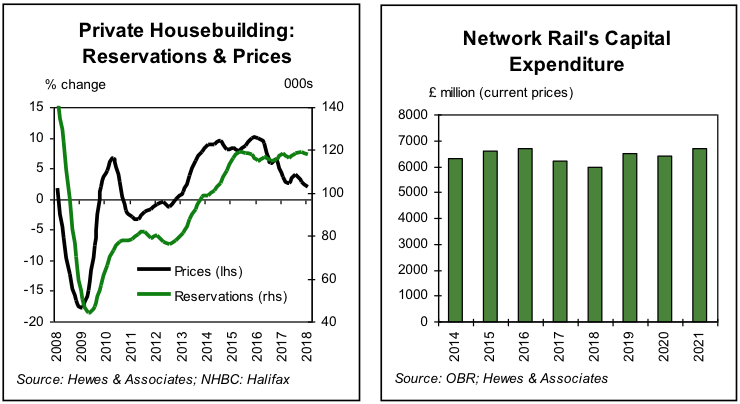 Weakening business confidence, alongside frail consumer finances, are affecting the commercial and residential property markets, which combined with public sector austerity suggests a changed outlook for GB construction. Private housing output has grown by 85% since 2012, and as a result this sector is now the largest GB construction market. Continued growth in private housing arguably relies upon further growth in house prices, something that cannot be assured – according to Halifax, prices are currently unchanged on the levels of August/September 2017. Meanwhile, a widespread lack of affordability alongside weak wage growth points to further reliance upon government assistance. In the commercial new build sector output volumes rose by 5% in 2017, while orders fell by 8%. The volume of office orders fell by 25% in 2017, and in London commercial orders are over 20% below the 2014 level. A weakening in the London market explains this situation, with development hampered by uncertainty and rising supply. In the retail sector construction is expected to broadly level off, while in the leisure market workloads are strong. More positively, infrastructure construction is set to benefit from a robust roads investment programme and large projects, such as Hinkley and HS2. Public non-housing, meanwhile, faces further modest decline alongside depressed capital budgets.